Phil Trent is a fraud, one who deliberately misrepresents the koryu bujutsu for the purpose of his personal ego gratification and who has indulged in countless incidents of trolling, manipulation, distortion, defamation and out right lies. The following article is to provide documented refutation of his claims and to provide a central source for these arguments - as sadly, such a document that can be quickly and easily linked to is necessary, for reasons I shall elaborate on in a moment. Phil Trent is a FRAUD - Phil Trent is Not Practicing or Teaching Koryu. Please note that for the sake of brevity this document is solely to provide a brief overview of the above listed points - however the full explanations along with supporting quotes, from acknowledged Koryu authorities including Meik Skoss, Diane Skoss, Dr. Karl Friday, Ellis Amdur, Dave Lowry etc, Sengoku period, and pre and post Sengoku period texts, packed with cited articles and excerpts from various publications is being made freely available. "Fake Koryu - A Case Study: Genuine Samurai Martial Arts Dallas, Karato Ryu and Phil Trent"
That Phil Trent is a fraud has been established by both myself and several other respected koryu practitioners throughout the online community and through various websites and facebook groups. His fake koryu, deplorable personal conduct and outright lies and insults to members of the legitimate koryu have seen him dismissed from multiple forums and sites of genuine study. That should have been an end to it. It would be easy and preferable to simply dismiss such an individual and ignore them, leaving them to do as they please. Unfortunately, Phil Trent is extremely active on social media, engaging in deliberate and repeated acts of disinformation that undermine the legitimate study and appreciation of the koryu. More troubling however, is that his school the "Genuine Samurai Martial Arts of Dallas", is anything but and in fact is little more than a criminal enterprise, in which he engages in fraud and unjustifiable acts of physical and mental emotional abuse. Such conduct should not and is not tolerated within the koryu community and several respected members have spoken up publicly and called out Trent for his false claims. "Lol. You spend hundreds of hours trolling online? Why? To destroy real Koryu? Well good luck with that". ....To be honest anything that can help protect future students from charlatans (in reference to men such as Trent - Batman) has got to be our aim, full support given". "I'd be damned if I'm going to be quiet while other honest folk are screwed about by people without the slightest fundamental knowledge of a koryū and defraud them of their time, energy, enthusiasm and hard earned money". All the above are taken from just one forum post on Japanese, and Korean Sword, Iaido and Kendo Enthusiasts of the World Facebook forum - the one in which Trent previously admitted to trolling. Sadly however, Mr. Trent simply makes new inflammatory remarks in a new forum, has the posts that definitively illustrate his poor conduct and evidence his fraud deleted and then claims that no one has ever provided an argument against his claims and begins the cycles of lies again. An independent document that will not be deleted is required. 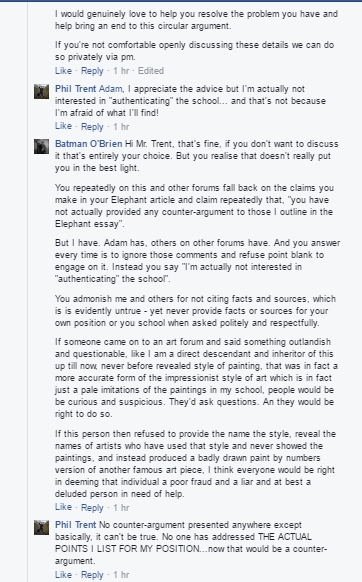 An example of Phil Trent, avoiding answering questions and refusing to acknowldge the repeted criticsm and refutation of his fraudulent claims on yet another Facebook Group. "a person who sows discord on the Internet by starting arguments or upsetting people, by posting inflammatory, extraneous, or off-topic messages in an online community (such as a newsgroup, forum, chat room, or blog) with the intent of provoking readers into an emotional response or of otherwise disrupting normal, on-topic discussion, often for the troll's amusement". 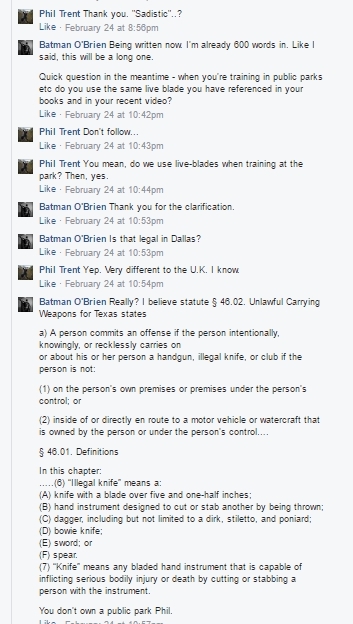 "I'm having fun in the "other group" defending this Group ... bad-mouthing them and Paul Richardson particularly...so every cloud..."
- Phil Trent, Asian Sword Arts- Iaido/Kenjutsu/Jianfa/Batto-do/Gumdo Facebook Group, March 10 at 3:11am. If you were bored enough to look at all my threads you will notice that I encourage the criticism you so predictably attempt to send my way. I drop little morsels and you guys pounce .....BTW, that alone is an indication of how much more genuine my training is than yours: it has taught me strategy. Remember that line by Rorschach from Watchmen: “I'm not locked in here with you... you're locked in here with me.”?" - Phil Trent, Japanese, and Korean Sword, Iaido and Kendo Enthusiasts of the World Facebook Group, March 10 at 4:19pm. "Come on, Sunshine, give it your best...actually that won't be nearly good enough...You've got nothing, you strange, pathetic, sad, superhero-fixated little man"
"I do like the fact that IMO as far as the practical aspects of bujutsu are concerned I am considerably more knowledgeable than 99% of those who claim expertise and can speak/write Japanese"
Phil Trent openly boasting of trolling Source: Asian Sword Arts- Iaido/Kenjutsu/Jianfa/Batto-do/Gumdo Facebook Group, March 10 at 3:11am. Firstly, I think it's important to establish I bear Mr. Phil Trent no ill will. In fact, on my first interactions with him, I completed his article, and tried to support him, and create open friendly dialogue. Unfortunately he chose to respond, to this and others with a consistently belligerent, condescending, insulting and contemptuous language. While I have never met the man, but he has chosen to promote himself by repeatedly lying on public forums, in his articles, and his publications, and as covered the full case study presented himself as a deeply abusive individual. However I'd like to post a brief summary of the arguments here. What is a Legitimate Koryu ? 1) What is the name of your style - then check that in the publicly available guides such as Koryu.com, in the David Hall's Encyclopaedia of the Japanese Arts and ideally in the Bugei Ryuha Daijiten. 3) What are the Student Teacher Dynamics like? - is the art being passed from one person to another or are they a domineering bully who teach their students wrong on purpose? 4) Is the art battle-tested and what evidence can be offered to support this? - again this is part and parcel of the lineage and the student teacher dynamics. 5) Does the Art Evidence the Peculiarities of Japanese Culture?- is the art intrinsically immersed in the Japanese social, political and religious beliefs of the time? 6) What is the Training Syllabus? Is it in line similar koryu, unified by a central theme or principle or is it a hodgepodge of random techniques and arts -some telling developed well after would be authentic timeframes. 7) How is training conducted? Is it safe, accurate helpful and educational? Or is it needlessly dangerous and filled with fake trappings? Phil Trent is a fraud and the Genuine Samurai Arts of Dallas, the style he calls Tenshu Shindo Karato Ryu is Fake Koryu because he cannot provide ANY of these details. Not a single one. Over hundreds of Facebook group posts, Phil Trent refuses to provide any of these details, instead constantly citing an article called "The Elephant in the Room" and advertising his books claiming these provide the answers. C) It's a secret, because he like to test his students to see if they can spot that he is teaching them wrong on purpose, I am not making this up, and because it's too dangerous for the public to know about. Oh and that secret schools are a tradition in the koryu. A) Having a name and a Lineage is fundamental to being a koryu. What he is suggesting is akin to being a famous style of painting that that does not use paint of any kind. B) Part of being in a koryu, particularly when teaching, is to care for and accurately pass on the koryu, including it's history. C) There is not such thing as "secret ryu" in Japan. At all. As noted earlier, all of this will be explained in comprehensive detail in a series of articles on this site explaing exactly how to spot a Fake Koryu and why Phil Trent is a Fraud.
" 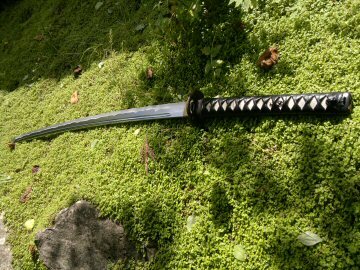 the name I gave it—Tenshu Shindo Karato Ryu"
"It seems hinky to me for more than one reason". "I have never seen the name that my instructor used for the school mentioned anywhere". Further he never publishes that name and refuses to answer any questions on it put to him publically on the matter. "If it is a koryu, nine times out of ten the style should be listed in the Bugei Ryuha Daijiten, a compendium of martial arts systems put together by Watatani Kiyoshi and Yamada Tadashi....If the koryu is not listed in the Bugei Ryuha Daijiten, I'd be very suspicious". Phil Trent cannot and will not provide the name of the style he claims is a koryu. And thus, fails the first criteria. "the passing on of methods from one generation to the next, is an essential characteristic of a koryu. It is done from person to person, teacher or senior to student. For better or for worse, it is the ONLY way for anyone in a koryu to be considered a legitimate exponent of the ryu. You have to have learned it from a living, breathing person" . Over the course of many discussions I, and many others have asked, Phil Trent to provide his lineage, given him examples of ours, and yet, with each and every opportunity he has run from this, failing to provide any trace of schools line - even within his book, Trent never mentions the name of his teacher, or his teacher's teacher. Given he cannot produce any credentials, at all; it is safe to assume he has none. A key part of the student/teacher dynamic is passing on the lineage - this cannot occur with the Genuine Samurai Arts of Dallas, as there is no lineage to pass on. "I never met said Soke and have zero proof that he existed. My instructor also claimed that he was in frequent contact with the family that owns the school, but again I have no evidence that that wasn’t a complete fib. And if that wasn’t bad enough, even the name for the school I use was mostly made-up by me about 20 years ago AND I have never seen the name that my instructor used for the school mentioned anywhere. " " ...all that is required of a koryu in order to be accepted as “the real thing” is for it to be able to show continuous line of instruction since its creation" . In the three key aspects of what defines a koryu - , a name, a lineage and a flow of transmission, are absent from what Phil Trent teaches. 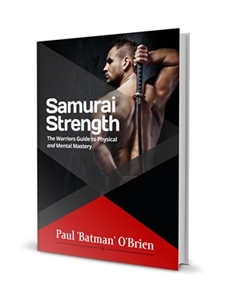 This is more than enough for me and any respected author and koryu practitioner, and member of the general public with common sense, to conclude that the Genuine Samurai Arts of Dallas is anything but genuine. It is a fake koryu, through and through. Trent responds to these legitimate and established criticisms by hiding behind the idea that he is preserving the secrets of the school. "... probably the most compelling justification for keeping deception alive in a koryu is that it was as an intrinsic component of all koryu and any attempt to remove it would not only be extremely complicated, but would fundamentally alter a koryu’s character" .
" The "secret ryu" is a convenient story in explaining away any lack of outside historical documentation or a provenance that can be independently verified. But the truth is, it's a story that, in terms of the koryu, doesn't have much credibility. 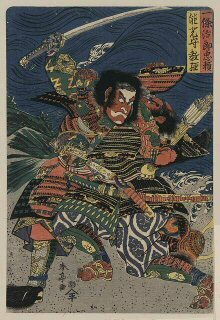 Remember this one fact: the martial ryu in feudal Japan was a political unit. 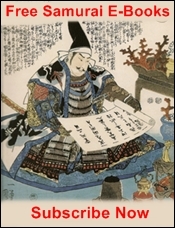 The ryu existed to further the interests of a clan or a daimyo. An "underground ryu" would have been as viable and as effective as an underground political party in a democracy. Can you imagine trying to persuade voters to support your platform but concealing from them at the same time the fact that your party exists? No. Sooner or later, for the party to be effective, its presence must be made known. A ryu was not much different during the feudal era (although of course, today it may be: very, very few Japanese are even aware of the koryu). Certainly all bujutsu ryu had their secrets. But secret ryu? Not in Japan. If not exactly secret, other impostors claim, their ryu are simply so obscure they have been overlooked by numerous and expert martial arts researchers and historians. This is an interesting claim--not because it's true; almost invariably it is not--but because it reveals how one culture (ours, in this case) can unknowingly transpose its own history and social customs on another (in this instance, that of Japan)" . It very obvious at this stage the Phil Trent is a fraud and that Tenshu Shindo Karato Ryu is not a koryu. And that the "Genuine Samurai Martial Arts of Dallas, are anything but genuine and authentic. For more details, download the full free guide to spotting Fake Koryu - here. 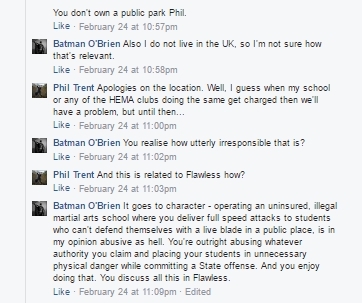 However, another troubling issue that frequently comes up in forums is that Phil Trent is fraud putting his students in unnecessary danger. Mr. Trent deliberately provokes and encourages suffering and pain in his students, by enabling and actively encouraging practices which are by his own admission unnecessary and dangerous, which results in the increased risk and occurrence of physical injury and deliberately creates an atmosphere of fear and deep paranoia among his students by placing them repeatedly in a physical and mental/emotionally unsafe environment. "the desire of the koryu to make the training dangerous even where it doesn’t necessarily have to"
Mr. Trent is using live blades and is not stopping at a safe distance, in order to "test" his students "courage". As I and many other authors have categorically stated such risk taking is utterly unacceptable. 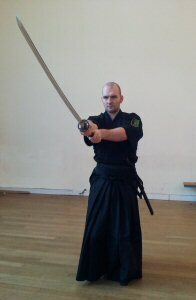 While many traditional koryu kata end with an undefended attack, this is not performed with a live blade, instead a dull Iaito or mogito is used or more often still a Bokken, and even then the cut is stopped at a safe distance, finished in a position so that should one stumble or is judge distance your training partner will be safe. "training is such that it is inevitable that occasionally one of the hits or falls that every student regularly takes will cause serious, permanent damage"
"a student may sustain a career-ending injury that prevents them from learning the most demanding kata and/or at least from continuing with the frequency and intensity of training necessary to make psychological progress"
"There is nothing more satisfying than watching a training partner get his weapon stopped by an unnoticed tree branch or stumble on an indentation". The full discussion, with detailed cited quotes of Phil's physical abuse of his students is documented in full in the free report available - here. With this in mind let's tackle the final issue I want to address in this post on why Phil Trent is a Fraud, and why the Genuine Samurai Arts of Dallas are Fake Koryu. Let's look at the psychological abuse. Phil Trent is a fraud. He does not do koryu. He does not understand koryu and Mr. Trent engages in deliberate unjustifiably dangerous training, putting his students at real risk, causing them pain and suffering, and thus is a sadistic bully of the worst kind as evidenced by the theme and content of his book. But beyond the physical abuse discussed briefly above, he engages in deliberate psychologically damaging activity designed according to him to induce PTSD in his students. This is horrific. "very disquieting sense of uncertainty"
"desperation and a sense of impending doom!" "by definition reduces the ability of an individual to be objective"
"If this phenomenon is hard to understand, I believe it to be comparable to those Vietnam veterans that came back from the war unable to “turn off” and consequently were forced to live in isolation for fear of involuntarily hurting those around them". "unbalanced mentality" is "highly useful in battle"
All of which he brags, leaves his students shell-shocked. "I have witnessed countless times students after a class struggling to remember where they parked their car, or what their plans were for the rest of the day, or even having trouble talking"
To summarise, Phil Trent is a fraud who is advocating in his book is a form of training that bears no resemblance to the koryu (his only knowledge of which he later acknowledges is from YouTube), a form of training that makes "the training dangerous even where it doesn’t necessarily have to" and encourages students to act in a manner reflecting these unneeded dangers in order to induce the same mental emotional trauma as "Vietnam veterans that came back from the war unable to “turn off” and consequently were forced to live in isolation for fear of involuntarily hurting those around them". But it's get's worse still - because Mr. Trent is openly breaking the law. In a discussion on Facebook, in which he gave me full permission to quote, I asked him if he first, insured to teach - to which he replied he was not. I then asked if he uses Shinken (live sharp blades) in his training against students while training in a public park. Trent confirmed that he does. This is both unsafe and outright illegal. The following screenshots are the full, unedited presentation of that conversation. The koryu are thrilling, and exciting, and hard work and, occasionally boring. They are physical, intellectual and emotional and for those who study them both frustrating and deeply rewarding, where you will find likely minded people in whom you can place your trust and your safety, develop close friendships and enjoy a unique, positive social interaction. I highly recommend you to try them if you have the interest, but if you see or hear anything like how Mr. Trent addresses things - leave. Seek a second opinion. Phil Trent is a fraud, teaching Fake Koryu. Do not place your health and safety in the hands of man who is unqualified, uninsured and who wants to harm you. No legitimate koryu school will encourage training in a manner to get you to break the law and make you complicit in criminal activity. No legitimate koryu school will encourage training in a manner that in uninsured. No legitimate koryu will encourage training in a manner that will put you and others in needless danger. 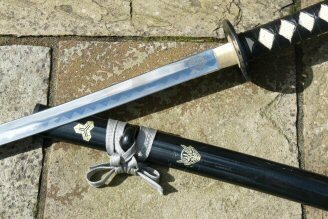 No legitimate koryu will act in the manner the Genuine Samurai Arts of Dallas, the Tenshu Shindo Karato Ryu and Phil Trent preach. This is because Phil Trent and his school are not a legitimate koryu. The "Genuine" Samurai Arts of Dallas are not genuine. They are not authentic. Thus any claim to such is fraudulent. Phil Trent openly acknowledges he charges for these lessons, lessons, conducted without insurance in public locations with the promise that they are "Genuine". Thus Mr. Trent is engaged in defrauding people of their time and money. "I do now charge a nominal fee, primarily to cover the time and materials required for me to build armor and weapons.... Also, I have on occasion made money through workshops inspired by my KR training"
I sincerely hope this article has helped you understand the danger that fraudulent teachers such as Phil Trent pose, not just to their students, but to to the arts they defraud and dishonestly claim to be. I hope this article prevents any more students, who would flourish and thrive under a legitimate teachers, having their time, energy, enthusiasm, health and money wasted by an egotistical fraud. Finally you can download the full report on How to Spot A Fake Koryu, a Case Study of Phil Trent - here. No signup is required. No email, nothing, this is freely available resource. Outside of debunking the fraudulent claims of Phil Trent, this has evidence in his own words of sadistic physical and mental abuse of his students and include details of Phil's open and confessed to criminal conduct. In addition this contains interesting history and facts on two koryu; Muso Jikiden Eishin Ryu and Hyoho Niten Ichi ryu that are generally unknown to the wider public and may be of interest. All quotes, sources, and material are fully cited. You've been reading about why Phil Trent is a Fraud. Check out my article on why Antony Cummins is Dangerous here.